Learn how Payoneer can help you direct deposit Amazon commissions from other countries, including China, and Japan! This is part 1 of our Payoneer Guide. Looking for part 2 or part 3? Earning commissions from around the world, with the numerous international Amazon affiliate programs, can sometimes seem like the easy part. It’s the process of actually getting those commission payments into your own bank account that can often become the real challenge! Amazon’s international Associates programs sometimes pay out commissions by mailing a local currency paper check but often they will only direct deposit to a regional bank which leaves your commissions stuck. After having faced this challenge in its various forms and trying multiple solutions for nearly a decade we are super excited to have watched Payoneer expand into the nearly perfect solution for affiliate marketers to collect their commissions from most any currency or place in the world and then have that money seamlessly deposited into their local bank account no matter where in the world that that might be. In the following article we are going to give you an overview of what Payoneer is, why it’s great (and the few limitations we’ve encountered) as well as how to sign up, then set up an account and finally, how to use Payoneer’s various local bank accounts with the international Amazon affiliate programs so you can then seamlessly transfer your commissions into your local bank account. Sound good? Let’s dive in! 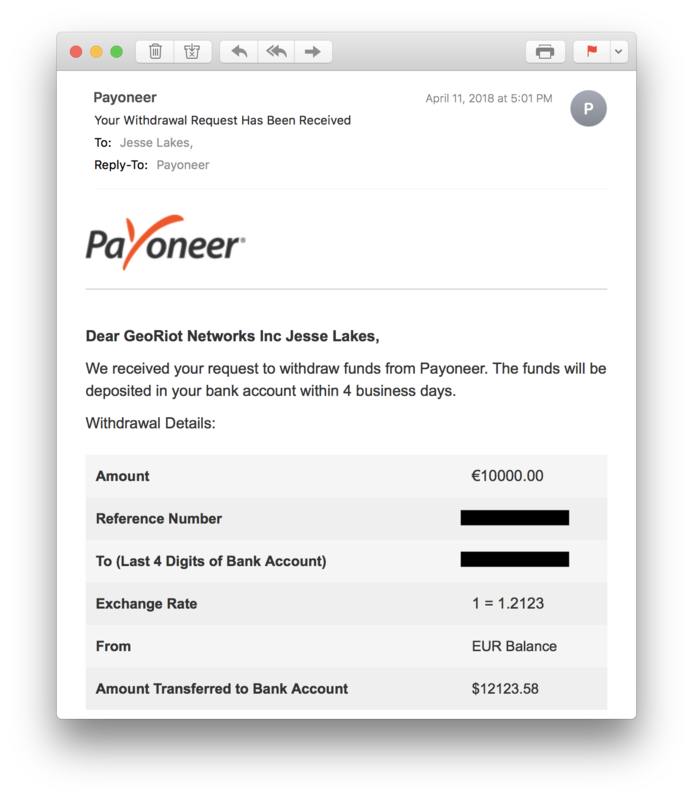 Payoneer is global payments company, somewhat similar to Paypal, where sending and receiving money anywhere in the world, and in most any currency, is fairly easy (especially compared to using a traditional bank). However, Payoneer has taken global payments (both sending and receiving) to the next level. 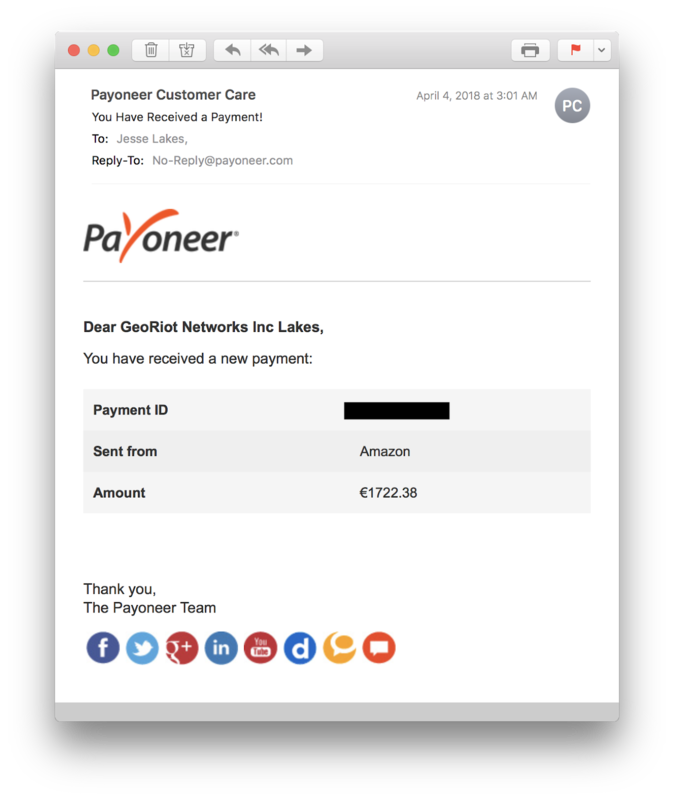 At Geniuslink, we now use Payoneer to quickly and easily collect most of our international Amazon affiliate payments and then seamlessly transfer them into our US-based bank account. No more waiting in lines to deposit foreign currency paper checks! Initially started in 2005, New York-based Payoneer has traditionally been very focused on helping out international sellers using Amazon’s Fulfillment By Amazon (FBA) program, however, we are now starting to see them expand on tools that can be used by affiliates (aka Associates). What makes Payoneer unique compared to a service like PayPal, and awesome for Amazon Affiliates, is that they provide regional bank accounts (“receiving accounts”) in their local formats to easily interface with various payers. This “Global Payment Service” feature, which is just one of the many international payment services they offer, is something we’ve quickly come to rely on to get commissions out of Canada, UK, France, Germany, Italy, Spain, Japan and the new Australia Amazon Affiliate programs and into our US-based bank account. The premise of using Payoneer with your Amazon Associates account is fairly simple. Creating an account with Payoneer grants access to several international “receiving accounts.” There is essentially a collection of the relevant banking details, like account number, branch name, etc but for bank accounts that are local to UK, Japan, Canada, etc. The banking details of those accounts can then be used when setting up the payments for each of the international Amazon Affiliate programs using the local direct deposit option. With these local receiving accounts, the option for a direct payment can be chosen and then these details can be inputted. 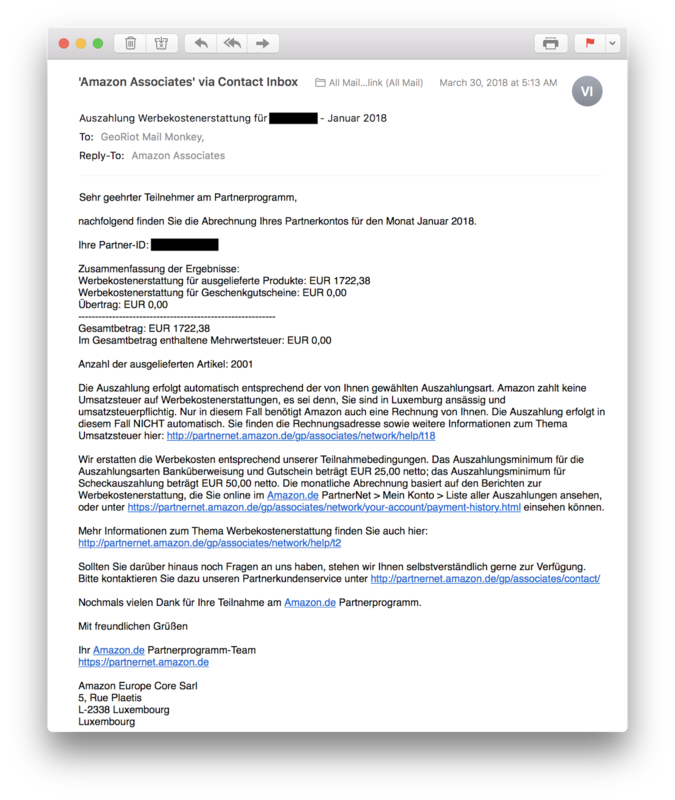 When Payoneer is set up, Amazon will send out an email each month that they made their payments (approximately 60 days delayed). A few days later, Payoneer will send out an email alerting that a new payment was received into your Payoneer account. Once the payment has been made and is in your Payoneer wallet, a withdrawal into your bank can be initiated in your local currency at any time. Just select the currency you have a balance for, select the bank you want the money sent to, the amount to transfer, leave yourself a note and you’re good to go. The money will then show up in your bank account a few days later. The simplicity of the process makes us happy for a few reasons. It’s completely transparent! We know the exchange rate, the timeline, and the final amounts. We don’t actually have to deal with any tellers or wait in any lines at our local bank! You’ll find step-by-step instructions below that will help get you set up with a Payoneer account and guides you through the payment settings in the various Amazon Affiliate program dashboards so you can start getting your international Amazon Affiliate commissions sent directly into your Payoneer account. While Payoneer’s “Global Payment Service” works great for receiving commissions from most, but not all, of the Amazon Affiliate programs. Payoneer works great for Amazon.com (US), Amazon.ca (Canada), Amazon.co.uk (UK), Amazon.de (Germany), Amazon.fr (France), Amazon.es (Spain), Amazon.it (Italy), Amazon.cn (China), Amazon.co.jp (Japan) and Amazon.com.au (Australia). However, Payoneer doesn’t (yet!) work with Amazon.com.mx (Mexico) and Amazon.com.br (Brazil). Rumor has it that support for Mexico is rapidly approaching (maybe summer 2018?). Further, we’ve learned that Payoneer isn’t able to transfer payments out of India, however, they can easily transfer money into the country. This means we can’t use Payoneer to get paid any commissions earned from the Amazon India Affiliate program, but someone residing in India can certainly use Payoneer to get commissions out of the US Amazon.com Affiliate program into their local India-based bank account. For getting affiliate commission payments out of India (amazon.in) we recommend using CueLinks. You can find a step by step guide to using CueLinks with Geniuslink to fully monetize the Amazon India Associates Program here. Onward to part 2 of our Payoneer Guide - signing up for an account!